A fallopian tube blockage prevents successful passage of the egg to the sperm or the fertilized egg to the uterus. Tubal Surgery is a surgery that can be used to try to correct this common cause of infertility. What are the different types of Tubal Surgery that can be carried out? It is used to repair a portion of the fallopian tube damaged by disease or to reverse a tubal ligation. The diseased or blocked portion of the tube is removed, and then the two healthy ends of the tube are joined. 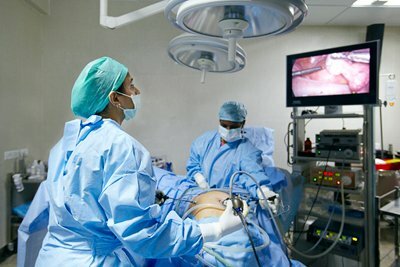 The procedure can be done using laparoscopy or through an abdominal incision (laparotomy). It is the removal of part of a fallopian tube when it has developed a build-up of fluid (hydrosalpinx), which is done to improve the success of In Vitro Fertilization (IVF). Hydrosalpinx makes it half as likely that an IVF procedure will succeed. It is done when the end of the fallopian tube is blocked by a build-up of fluid (hydrosalpinx). The procedure is used to create a new opening in the part of the tube which is closest to the ovary. But it is very common for scar tissue to regrow after a Salpingostomy, re-blocking the tube. It is done when the part of the tube closest to the ovary has scar tissue or is partially blocked, preventing normal egg pickup. The process rebuilds the fringed ends of the fallopian tube. It is used for a tubal blockage next to the uterus. It is known as the nonsurgical procedure. The doctor inserts a cannula, or catheter, through the cervix and the uterus and into the fallopian tube using either fluoroscopy or hysteroscopy to guide the instruments. When is Tubal Surgery used? There are blocked fallopian tubes. A blocked fallopian tube has hydrosalpinx (build-up of fluid). You want to have a tubal ligation reversed. What is the necessary treatment procedure? To prepare you for the tubal surgical treatment process a sedative (medicine) or anesthesia will be administered to numb the area, to help you relax, or to help you sleep. Then according to the type of surgical approach selected (as discussed above) the treatment proceeds.